Buildings represent more then bricks and mortar - they are the setting of many memories and stories spanning generations. The pub is the last remaining building of what was the Greenhey's Estate and our beer garden is the former Victorian Road. We LOVE hearing about the history of the pub and have been lucky enough to hear stories from former residents, local historians and the family who had the pub for 30 years. We will be attempted to collect all the stories below on this page. If you have any stories regarding the pub or Greenhey's estate please drop us an email at theoldabbeytaphouse@gmail.com. "Congrats at taking over one of Manchester’s most iconic pubs! Our family are all from the Greenheys area and my mum was born at the house next door to the Old Abbey! Our book is called “Square Roots” and is based on the life and times of the strong women of our family, from around Greenheys. We are aiming to launch it in August next year, on what would have been our Great Grandma’s 123rd birthday. Here’s some more info on the book http://squareroots.webs.com/ and as you can see, the Abbey gets a mention. The website will expand over time but this holding page is just for starters really. " - Liz Faye, Photos courtesy of Liz. "I'm a historian researching a history of anti racism in Manchester since 1945. Together with a fellow historian Shirin Hirsch, I was discussing how we can bring the history to life so it is not forgotten. I was part of the team that organised the '40th anniversary celebration of the Northern Carnival against the Nazis exhibition in NIAMOS. 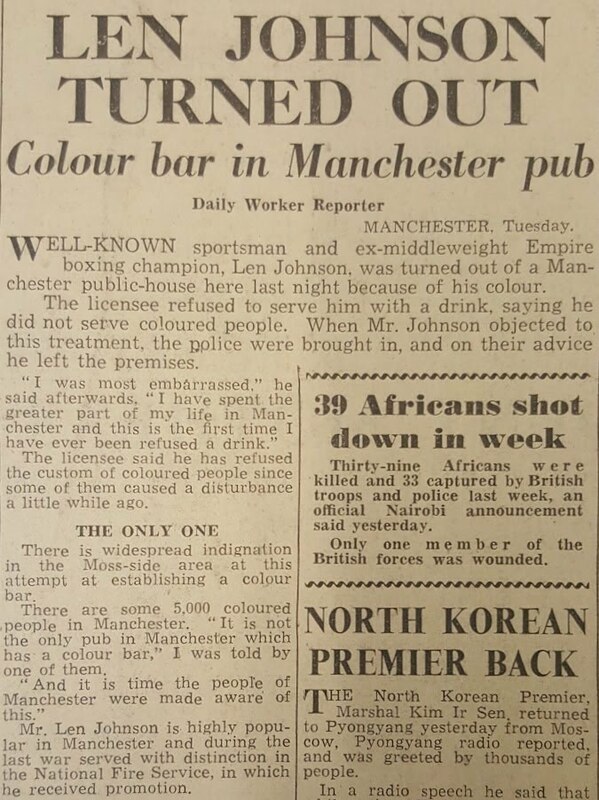 Two of the greatest anti-racist activists of post war years, both Communists, the black boxer Len Johnson and the scaffolder Wilf Charles, campaigned against the colour bar in Manchester. I've put something about what they did below. 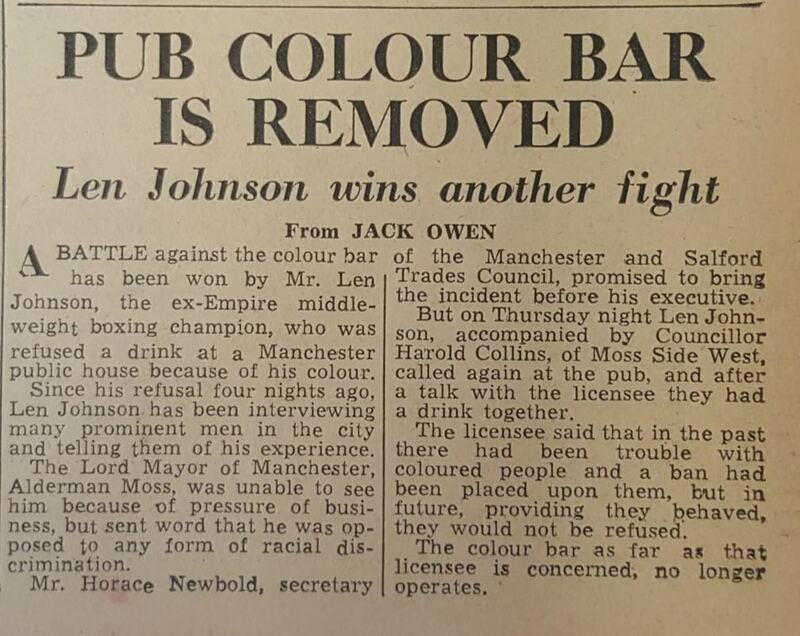 Getting rid of the colour bar at the Old Abbey was one of their victories. It was reported at the time, see the attached newspaper clippings." "We campaigned then in the pubs for the freedom of people to be able to go in without discrimination and we had a big campaign against the Abbey pub in Park Street, Moss Side, who refused to serve coloured, Blacks and we forced a test case and got that lifted and that had a big effect. Len ... ordered two pints and they said we don't serve Black men... I insisted they would serve him or no-one else would get served. So they brought in the police and they asked us to go - we created a tremendous problem inside the pub. Next day I went to see the Lord Mayor and the Bishop of Manchester and got statements that they deprecated this action and ... we put on a mass picket of blacks and whites from the Communist Party and progressives - some 200 people - so the ban was lifted in a matter of two or three days. [This was] round about 1948 or ‘50. I've got the newspaper cuttings somewhere..."
We were lucky enough to host the Wrap Party of Reel Mcr's film "The Spirit of Hulme" which documents the history of Hulme / Greenhey's estate and the battle over housing and brought together former residents. Reel Mcr were also kind enough to donate us framed pictures of local people out campaigning at the time which you can see on the walls of the pub. Watch the film below! "The Spirit Of Hulme is a whistle stop tour through 70 years of Hulme's history. Focusing on some of those who fought for better housing conditions and the right of the Community to be consulted on what replaced the system build housing that had, largely, failed within seven years of construction. This was a Heritage Lottery Funded project made by past and present residents of Hulme, MMU film students and REELmcr."